The bulletin is here. The description of Holy Friday with the Bible readings and commentaries is here. A photogallery is included here. Last year, 2 weeks later than today, Good Friday was brilliant sunshine with warm temperatures. Nature was abuzz – the birds looking for nesting, squirrels looking for food and others. It was the type of day you sit outside and feel the wonderful breezes. Not very characteristic of the day Jesus had! This year was unsettled – cloudy with rain showers early in the day but clearing with a decidedly cooling breeze. We had 16 at the service, down from 30 last year. This service continued our worship through the Triduum, the last three days of Holy Week. It was the day of the execution of Jesus . This service begins and ends in silence. Since the fourth century, Christians have commemorated the crucifixion of our Lord and Savior on this day. for Special Days" which contain key services in Lent – Ash Wednesday, Palm Sunday, Maundy Thursday, the Great Vigil. Good Friday is good because the death of Christ, as terrible as it was, led to the Resurrection on Easter Sunday, which brought new life to those who believe. The service has 6 parts 1. an entrance in silence, 2. readings which include the John 18:1-19:42 Passion reading, 3 the Solemn Collects, 4 The Entrance of the Cross, the Veneration of the Cross,5 Musical Meditations and 6 Conclusion. Tthe first reading is from Isaiah, the ever present Psalm 22, and Hebrews. Catherine John Passion Gospel reading, John 18:1-19:42. David Lose writes of Good Friday "We are used to thinking of Good Friday as a day of solemnity, even of grief, as we ponder the sacrifice Jesus makes for us with his death on the cross. Lose continues,"But have you ever thought of it as a day for celebration? 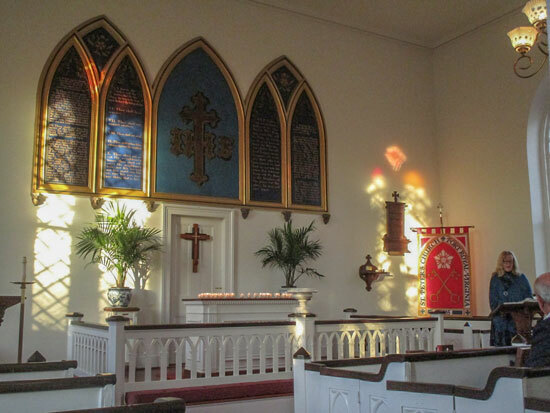 If you take care in reading John’s Gospel – the Passion narrative appointed for Good Friday (the Synoptic accounts are read on Palm/Passion Sunday) – you’ll realize quickly that celebration is probably more the mood John invites then solemn grief. Because, according to John, Jesus’ death is no tragic accident but rather the culmination of Jesus’ earthly mission to rescue a fallen humanity from the power of sin, death, and a world captive to evil and draw them to God’s abundant life. Jesus, in other words, goes to the cross not just willingly but eagerly, for the cross is actually his throne, the place where he will be lifted up and from which he will draw all persons to himself (Jn. 12:32)." There are moments of bright light in the Good Friday story as Justin Taylor and Andreas Kostenberger point out – "A bright irony on this darkest of days is that the men who step forward to claim the corpse of the Christ for burial are not family members or disciples. They are members of the Sanhedrin: Joseph of Arimathea and Nicodemus. It is one more unexpected thread of grace woven into this tapestry of redemption. They quickly wrap Jesus’s body in a sheet and lay it in a nearby tomb. Evening is falling and they don’t have time to fully dress it with spices." The death is portrayed as an exaltation; it’s the way of his return, of his circuit back to the father from whom he had come. The phrase is constantly used "that the scripture might be fulfilled." The Solemn Collects in the Prayer Book provide this theme of an active Christ and his mission alive – "Our heavenly Father sent his Son into the world, not to condemn the world, but that the world through him might be saved; that all who believe in him might be delivered from the power of sin and death, and become heirs with him of everlasting life." The sermon provided guidance to find the meaning of Good Friday and a way to approach the events in our life. "In addition to opening for us the way to eternal life, Jesus showed us how to face the end of our lives gracefully. In John’s gospel, Jesus does not resist death. At the end, he says, “It is finished.” Then he bows his head and gives up his spirit. "What we can learn from this last moment in the life of Jesus is how to live every present moment that we have left in our lives as if each moment is our last, the summary of the lives that we have been granted, and to offer our moments as gifts and offerings to God and to one another." "In her book, The Gift of Years: Growing Older Gracefully, Joan Chittister points out that the gift of getting older is that we come more and more deeply to know that everything in life has meaning. We cease to take life for granted, because we know that life is now, this very moment. We come to understand that “What we haven’t lived till now is still waiting for us. Behind every moment, the spirit of life, the God of life, waits….” and that every small thing we do is meant to take us deeper into the substance of life itself. In each moment is everything we have ever been and will become. And each moment is calling us to enter the fullness of life, to be gifts and to offer ourselves. " After the sermon was the veneration of the cross, the dramatic entrance of the cross. 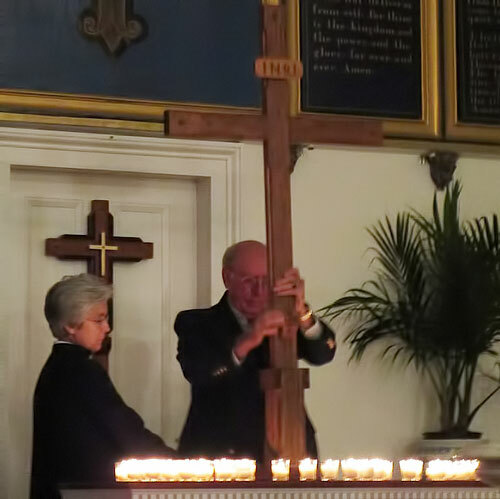 The raising of the cross is slow but dramatic as it is raised and placed on the altar. The Veneration are three readings about the cross with anthem interludes about the cross. 1. "Beneath the cross of Jesus" 2 "Jesus, keep me near the cross" 3. "The Old Rugged Cross"
After the veneration was the Musical Interlude. This year we prayed at the altar for the light from Christ that we can share with the world. After praying each of us took a votive candle home to share the light. The service concluded with the Lord’s Prayer and Concluding Prayer – "Lord Jesus Christ, Son of the living God, we pray you to set your passion, cross, and death between your judgment and our souls, now and in the hour of our death. Give mercy and grace to the living; pardon and rest to the dead; to your holy Church peace and concord; and to us sinners everlasting life and glory; for with the Father and the Holy Spirit you live and reign, one God, now and for ever. Amen."